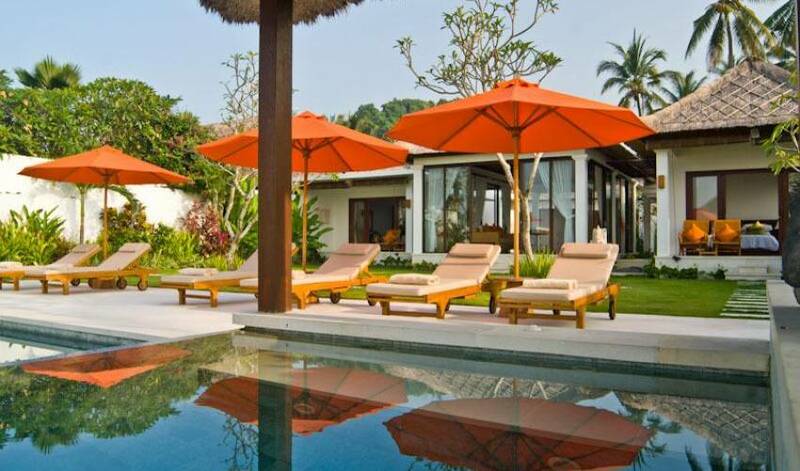 Villa 3569 is a stunning, brand new, four bedroom sea-front villa in Candidasa, East Bali. 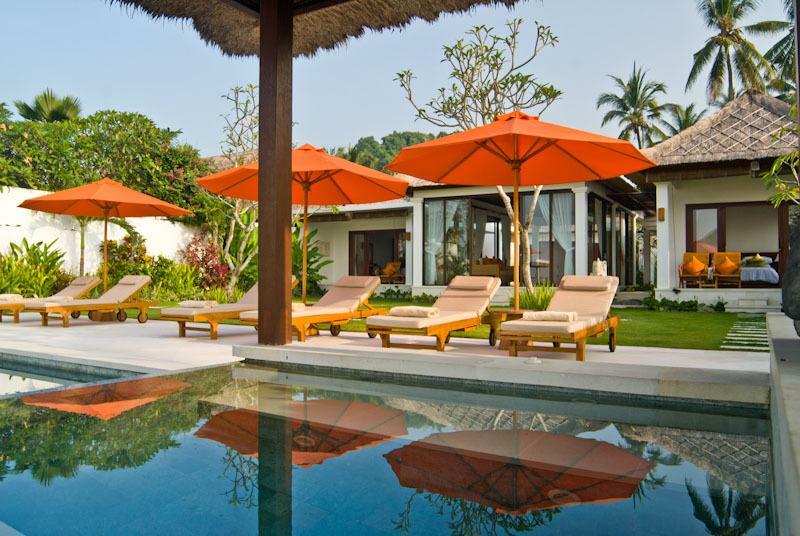 Located at the Lombok Strait, this 1000m2 property has 4 large bedrooms, each with en-suite bathroom and soaking bathtub, and an open living/dining area. Other facilities include a fully equipped kitchen, a 15m infinity pool and outside jacuzzi. The sea terrace, with its covered lounging area, provides dramatic ocean views and direct access to a sheltered swimming and snorkeling area in front. Rooms have been furnished and decorated to the highest standard, using local designers and artisans. 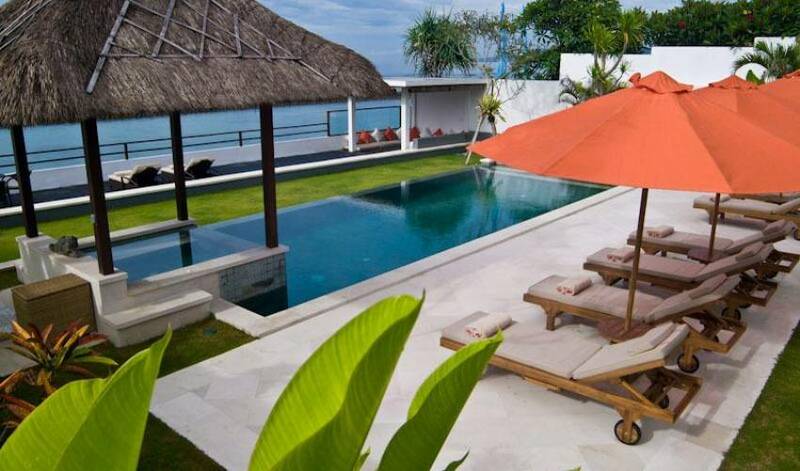 Villa 3569 is a brand new, sea-front villa and one of the best situated and equipped properties along the east coast. 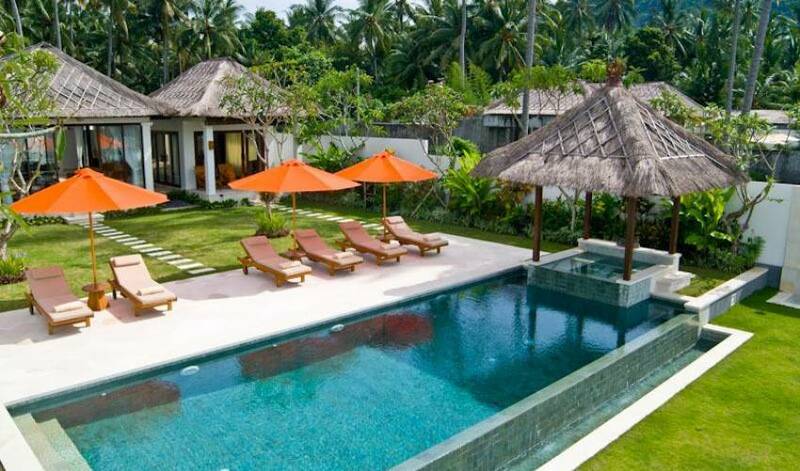 It has been designed and built in traditional Balinese style, with wooden beams and typical 'alang alang' roofs. Furniture and decorations were carefully selected to match the exterior, yet providing a unique and distinctive flavor. Virtually all pieces were locally designed and hand made. 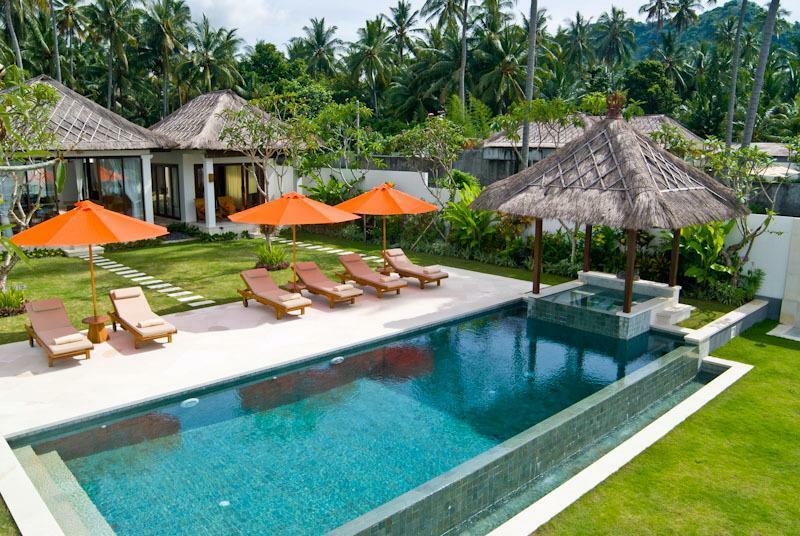 Villa 3569 is an oasis of tranquility and understated luxury, located directly at the Lombok Strait, providing a unique ambiance in one of the best settings in East Bali. There are 4 large, self contained bedrooms, each with en-suite bathroom and soaking bathtub. The 2 suites at the front both have king size beds, spacious walk-in closets and a private terrace looking out over the sea. The master bedroom covers 25m2 and is equipped with a large 2.40m x 2.20m four poster bed. The bedrooms at the back are identical, measuring 20m2 each, and like the suites have large size bathrooms with bathtub and shower facilities. One of the rooms has a king size double bed, the other twin beds. There are 2 full size rollout beds available if additional capacity is required. All bedrooms have been equipped with 32 inch LCD screens and DVD player, for which a selection of movies (including children's), in various languages, is available free of charge. Likewise, all rooms come with AC and safe deposit boxes. The living area covers some 70m2 and was designed as an open space, in order to fully enjoy the unobstructed views over the Lombok Strait, the cooling sea breeze and the gentle noise of the waves. Sliding windows provide instant protection against the elements or when additional privacy is needed. 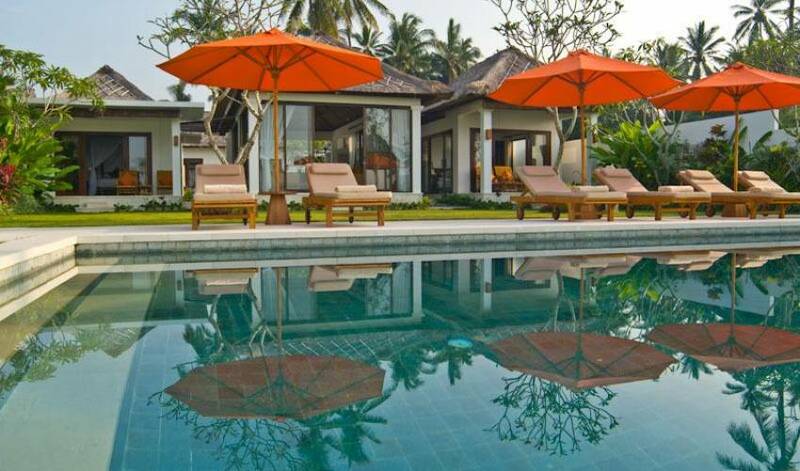 The high roof, made in traditional Balinese style, adds to the spacious feel, while 2 hanging fans provide relief on hot days. The living room comes with a 32 inch LCD TV with satellite and DVD, as well as a stereo set with iPod connection. The dining area boasts a massive wooden table, locally made, that can seat 10 people. With the sea on one side and a fish pond on the other, it provides the ideal ambiance for a perfect meal. The entertainment area at the far end of the room is suitable for traditional dance performances, which can be organized by our staff. From the living room as well as the 2 suites, steps lead into the landscaped garden towards the infinity pool, measuring 15m x 4m and overlooking the sea. Next to that is a 2m x 2m jacuzzi, seating 4 persons. 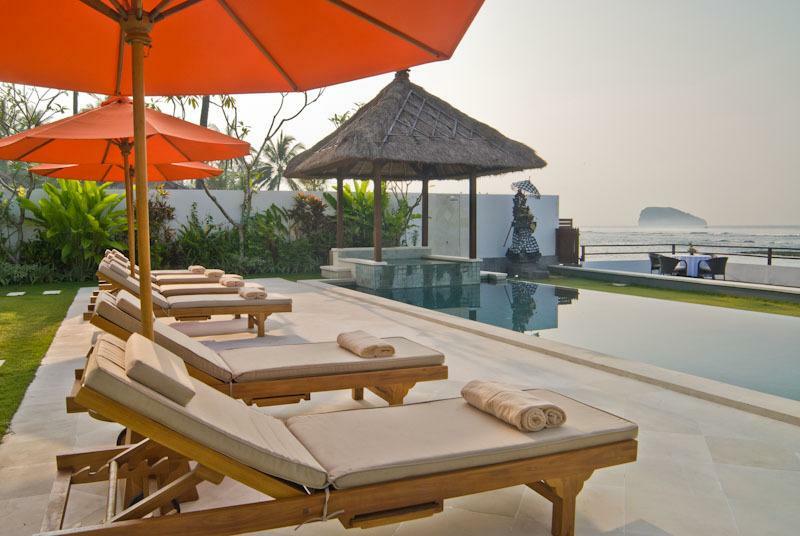 The 6 sun beds on the paliman stone terrace complete the picture of an idyllic relaxation area. This is a unique feature of Villa 3569, providing splendid ocean views and, via specially made steps, direct access to a sheltered snorkeling area in front. The sea terrace has a floor of volcanic stone, sourced locally, with on the one side a seating arrangement and 2 additional sun beds, ideal for breakfasts and afternoon teas. On the other side there is a distinctive lounging area, gazebo style, with carved-out seats, which is the perfect spot for sunset cocktails or a romantic dinner. A floodlight, situated on the roof, lights up the sea at night and adds to the unique atmosphere that Villa 3569 provides. Villa 3569 guests are provided with a complimentary breakfast. Western meals are available, but the staff will also be very happy to prepare local Balinese dishes for a unique cultural experience! Dinner parties and small functions can all be catered within the villa for a group of maximum 10 (staying) guests, or up to 30 for cocktails or buffet meals - please ask the chef or manager for more details, whether you are requesting breakfast, lunch, dinner, or snacks. Massage, body scrubs, facials, pedicures, manicures are just some of the spa treatments which can be provided in various onsite locations (for example, on the Sea Terrace). A full range of treatments are also provided by outside spa providers. Once you are in residence please ask the villa staff to assist you to make appointments. Babysitting services can be provided on request. Currently the rate is IDR 50,000 (USD 6)/hour. Please note that these charges will be added to your final bill. No payments are to be made directly to the staff. Car rental (with or without driver) can be arranged after your arrival. Motorbikes are also available for hire. Please contact our staff to arrange for this. Airport pick-up, at an additional charge, can be arranged in advance through the booking form. Villa 3569 is an excellent home base for exploring the unspoiled and tranquil area of Eastern Bali - with its dramatic scenery, unspoiled beaches, excellent fishing, magnificient underwater coral reefs and WWII shipwrecks for world-class diving and snorkeling, river rafting, and tropical forests and beautiful rice terraces for viewing and photographic pleasures. Other opportunities include viewing local Balinese Hindhu temples, as well as seeing a very authentic form of life and reknowned artistic craftmanship in the Balinede Aga village of Tenganan. 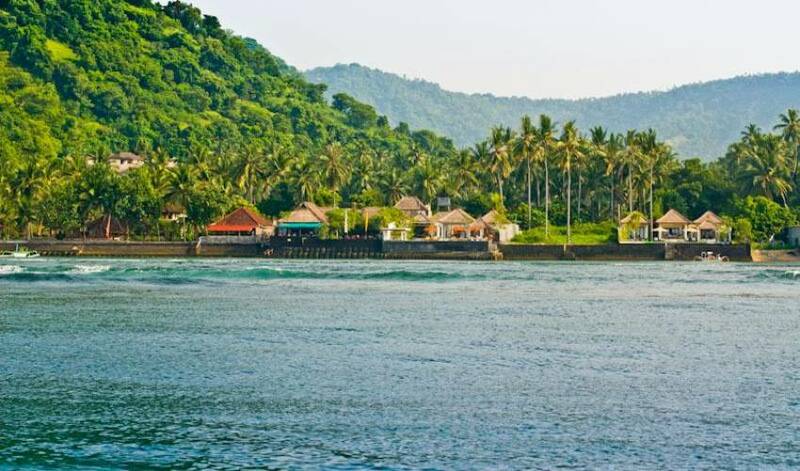 East Bali is the mecca of scuba diving and snorkeling and some of the island's top sites are close to Candidasa; just offshore from Villa 3569, Gili Tepekong can be reached in only 10 minutes by boat. In addition, there is some excellent rafting to be done on the Telaga Waja river, about an hour and a half away, reachable via magnificent mountain roads providing unobstructed views over the lush green paddy fields of East Bali. 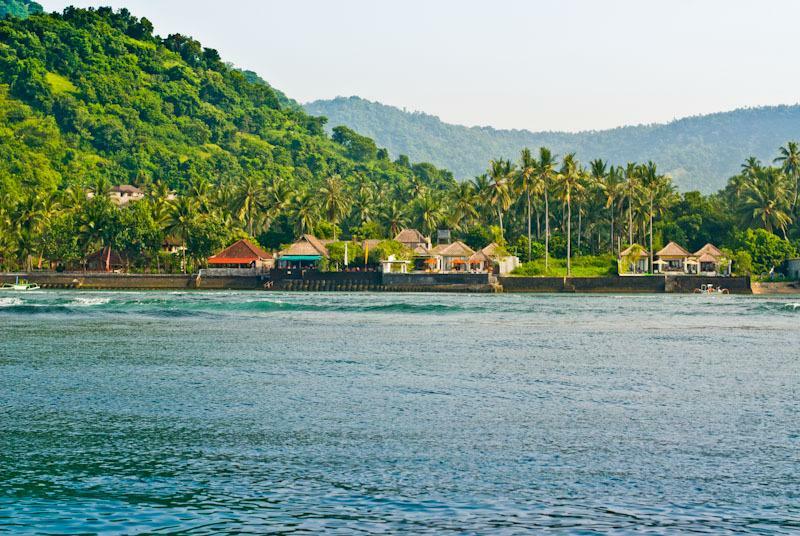 The port of nearby Padang Bai provides shelter for yachts and is the starting point for ferries to Lombok and its famous Gili Islands, as well as smaller boats to unspoiled Nusa Penida. For family entertainment there is a host of options, from easy snorkeling in one of the nearby marine reserves, or even just in front of the villa, to the famous Bali Safari and Marine Park half an hour drive away. Even swimming with dolphins, off the coast near Sanur, is a possibility. Just minutes away, Pantai Putih is a stunning white sand beach in a beautiful setting, providing easy and safe swimming opportunities. Our knowledgeable staff can assist you with planning activities and car rentals (with or without driver) can also be arranged. Villa 3569 carries a full contingent of well-trained staff, which will be at your disposal. Depending on your preferences and requirements, the number can be increased or decreased, or working times can be adjusted, so as to guarantee a level of comfort and privacy geared towards your individual needs. Villa Manager - Meets and greets guests on arrival, leads the staffing team to meet the expectations of each guest. Two Villa Attendants - In charge of housekeeping, laundry and F&B service. One Cook - Trained in local and international cuisine and in charge of the market shopping and preparation of guest meals. One Security Guard - On-duty to ensure the safety and security of the guests and the premises. Two Gardeners & Pool Attendants - Work discreetly in maintaining the landscape and the pool without disturbing the guests. 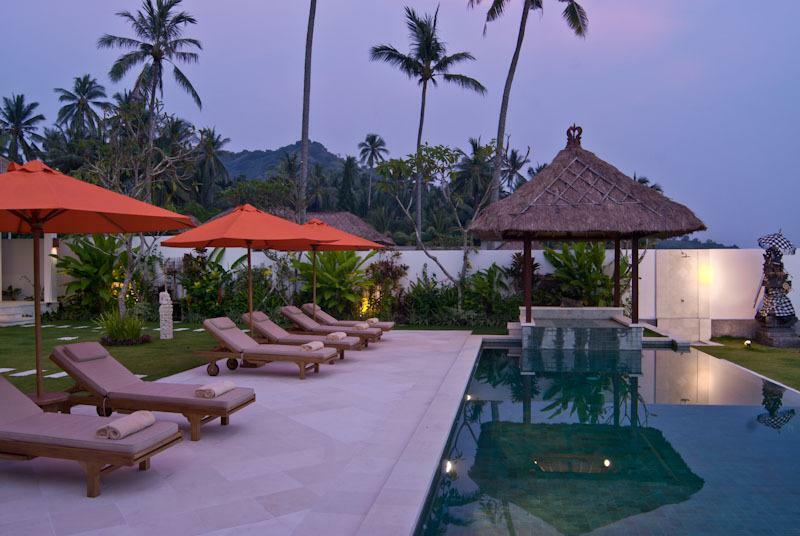 Villa 3569 is magnificently located at the water edge, with unobstructed views over the Lombok Strait. 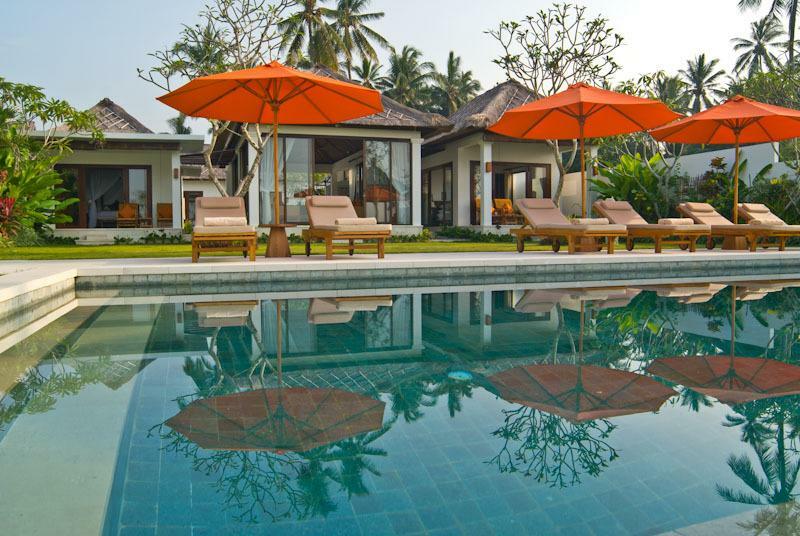 Whilst the property provides on the one hand completely secluded and private relaxation, it is just walking distance from the Jalan Raya, the main road through Candidasa, with its quaint collection of artisan shops, grocers, restaurants and lounge bars. Less than 200 meters on the left, fishermen returning from their nightly trips collect their catch for dispatch to the local markets. The same distance on the right, one can observe the village children bathing and playing in the lotus pond at sunset. Right in front, a sheltered bay provides beautiful and safe snorkeling all day long. 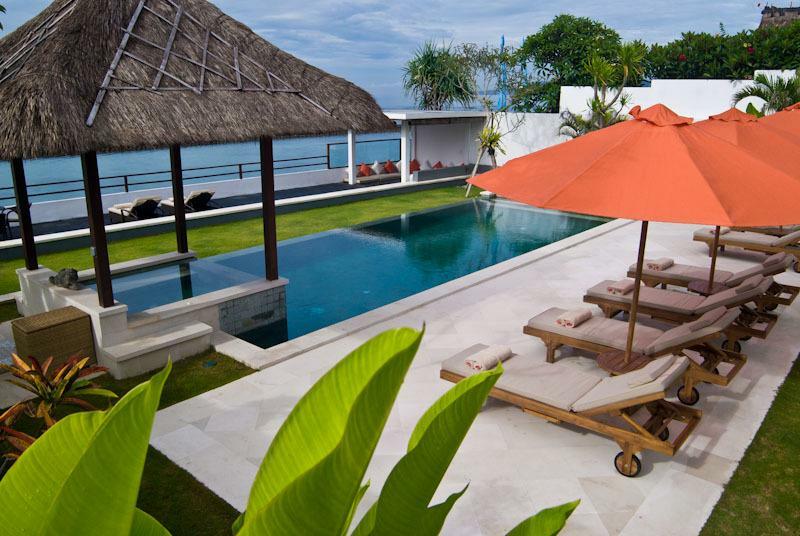 Within comfortable driving distance from Ngurah Rai international airport, Villa 3569 provides an unprecedented combination of private sea front setting, fishing village scenery and direct access to a host of local and international F&B establishments, entertainment and cultural activities, all within the tranquil and unspoiled surroundings of East Bali.